OK.... lots to catch up on still! The project continues.... now that I have it "running" - I have to finish up fab'ing up brackets, mounts, etc before I can get it on the road... and oh yea, I don't have a fuel tank either - so hard to really get a ride in like that... so during this down time, it was a great opportunity to go through and sort the wiring, fab up some brackets and go over the bike with a fine toothed comb. This entire run of photos is simply the fab work done for the Acewell/Ignition/Gen light mount. I wanted something quite simple, strong and industrial - so a trip to the hardware store I came home with a steel plate. Photo 51 - as the bike sat after valves, oil change, etc..
Photo 53 - I wanted to make it rather small, not interfere with the clutch/throttle cables... and that took a few tries and decided on this layout. Photo 54 - Next it was time to sketch/trace them onto steel. Photo 59 - One I got the bracket back to my garage I sanded and mounted it. I used some spacers (cut aluminum rod for a nicer spacer than washers) to give it distance for the cables.... Everything looked nice so it was ready to start cleaning up wiring and mounting up the gauges, ignition and GEN light. Next was to get the "organizing of wiring" and headlight mounted back together! ..... and the saga continues!! Next up in this list is to sort and organize all the wiring for the headlight/bucket and route it neatly and in a tidy fashion which proved to be a lot more difficult..... as well as figure out a nice way to mount my license plate! Photo 60 - I ordered a roll of TESA tape and some braided cable sleeve. I started with the ignition switch, then the headlight and turn signal wires, then wrapped all the other extra wiring. Like I said, it was a challenge! Photo 61 - With the gauge and ignition switch mounted, it looks quite nice from the top, even though it was a tight squeeze underneath.... the GEN light was difficult as I had to made the hole large enough to get it through without soldering it after it was mounted - so I used a nice aluminum angled washer for it to set down in. I polished the washer up as well. Photo 63 - once headlight was mounted, it was time to finish tucking cables away. I actually had to mount and dismount the headlight a few times to figure out the cleanest way as to not chafe the wiring or the painted surfaces. So far I have not seen any issues. Photo 64 - Finally - the front wiring is done and everything is mounted as it should be - and most importantly - functioning properly! Photo 65 - Next my attention turned to the back of the bike. I had my license plate hanging up on the wall for 6 months with numerous thoughts on where it should be. I still had not even heard back from VonZeti about either my seat or subframe in almost a month and a half - so I figured I didn't want to mount it off the subframe anyways - and since I couldn't mount my rear fender I was modifying until the subframe arrived - I guess I didn't have a lot of choice. I had seen some people mount them off the final drive and I didn't feel too keen about that either, so I used the pinch bolt for the rear axle and some steel strap that I drilled, bent and rounded the corners off of. The result was pretty good - even though it isn't legal in many states - I figure when I am done with this bike, an officer has to be having a pretty piss-poor day to write a ticket for it. Photo 66 - The view from the posterior.... clean and tide location, easily visible.... once the subframe arrives, I also plan on adding a white LED to shine straight down to illuminate it. Photo 67 - This last photo is simply because Forgeline, who is a marketing partner of the race team I drive for, sent me this nice little light-up pen & stylus... and I would LOVE to see them take a stab at some custom wheels for me. Excellent progress! I saw some pics of the "real" tank on your instagram page, looks cool! Glad you enjoyed Texas, I mentioned to my wife you were racing in Austin and she said we oughta go but just couldn't make things work, schedule wise, on such short notice. Maybe next time. As I mentioned in a post that I accidentally wiped out (sorry, really) your oil temp pickup point is an excellent idea and I bet it gets about as true a temp reading as possible. I saw another member congratulate you on the positioning of your oil temp sender and decided to have a look. Neat placement, but please be very sure that both the threads and the device itself can handle high pressure - these boxers can develop extraordinarily high oil pressures, especially wen cold. Hey Tony - the fitting uses a pipe-thread, so it is tapered...which typically is great for high-pressure. So far - zero leaks and seems to work flawlessly, but I will keep an eye on it! haha - thankfully - no tech here... wait until you see what I did to ROAD TEST it without a tank - pics coming!! Thanks Justin - I tested the circuit, followed the right procedure and it charges - though my updates are slow - I have over 100 miles on it so far and have not had to charge or had a loss in voltage at all. All seems great! Ditto on what Tony said about pressure. I installed a 150 PSI gauge on the "Project Junkyard Dawg" and first startup on cool morning I had to remember to keep the revs down for a few minutes or I would peg the meter! .... Justin eluded to seeing some photos of my tank on instagram - but here is the process. My goal was to have a clean look - so chose matte satin, matte white and a matte titanium color, which matched some of the accents on the bike such as the handlebar end caps and brake lines. My helmet painter of 12 years, Mike Corby (Corby Concepts in Indianapolis) was tasked to do the work for me. He also had to completely repair the local place did when they "fixed it" and re-coated the inside for me... I was charged for pretty crappy work - then charged again to fix it after the fact. This was pretty much the only regrettable part of the build to date. Photo 68 - Tank and modified fender with first round of satin. Photo 70 - This was a special color Corby made up - called Platonium. It works well. Photo 73 - Removed - now ready for a matte white to finish it off. Once that is dry, then several rounds of satin clear go on! Got some shipments in a few weeks ago.... some meant "more maintenance to do" and others were ..."HELL YEA.... FINALLY IT WILL LOOK LIKE SOMETHING!" - My painted fuel tank!!! Photo 74 - The first issue was opening up the package and finding a cracked gasket! I called up BMW Motorcycles of Countryside and they sent out a replacement, next day - no charge. These guys have been ROCK SOLID for me in getting this bike mechanically sound. I have ordered ALL of my BMW replacement parts from them and their techs and parts guys have been hugely helpful. Photo 75 & 76 - Next was figuring out a way to warm up all the fluids without a seat or fuel tank.... I opted to create a smaller "portable" tank out of a water bottle... and I remounted the original subframe and placed a floor pad on that. Yes, I know... looks janky as hell - but I wanted to make sure everything functioned and wanted to do all the fluids before re-assembling and fitting with a tank. It fired right up and I set off within my subdivision to do a few laps to warm up the fluids. All was going great until it started to sputter and die. I looked down...gave the bottle a few squeezes and she came back to life. I went through the whole bottle nearly..... and that was good for just over 3 miles of circulating around safely through the neighborhood. I parked the bike, drained the oil, dropped the pan, drained the gearbox, final drive and shaft oil - then set about replacing the neutral switch, cleaning the pain and the bottom of engine, checking and cleaning the sump screen and took my time reassembling everything. Photo 77 - I was especially happy to receive these ContiClassicAttacks as well. These look great and was ready to start pulling off the wheels and take them in to get swapped out! Photo 78 & 79 - The tires though went into the corner when the other box arrived from my racing helmet painter.... I was anticipating this baby!! Photo 82 - Also 2 new BMW roundels showed up.... perfect timing as well! Kid in a candy store! Photo 84 - I noted a very cracked and worn out o-ring for the filler cap as well, so texted my parts guy and ordered a replacement - they were in stock and received it the very next day. So we are getting close to caught up and was able to spend some fun evenings emptying boxers and figuring out what to do next! Marc, if you don't quit it'll be too purty to ride! Your tank sealed the deal for me on my R100RT fairing re-paint. I have almost all of the chips and cracks fixed and was trying to decide between gloss black (like rest of bike) or sem-gloss black. I think I'm going to use the rest of that quart of Dupont "Hot Rod Black" and kinda stealth it. I may be able to get back to it now that the '57 has AC! Hey again folks - I am just over a week away from debuting my project bike build! This is the only forum I have really kept a running tab of the progress, but will be writing up a full build report with some nice photos in the next couple weeks. 1. Tank got MOUNTED and all seemed well... and I put the old subframe and seat to run a tank or two of fuel through and work out some tuning issues - which now seem solved! Photo 80 - Corby Concepts nailed my request and I mounted up this gorgeous satin and matte white/titanium finish tank. A far cry from where it started with. Photo 81 - The tank fitment on the R65's seem easy - but I wanted to protect the tank and frame a bit more so used some high density foam cut and fitted to the center section (about 4" long) and then on each side where the back of tank gets close to the inside edges of the tank. Secured with industrial strength 2-sided - they make the fitment secure and avoids any jarring or extra movement in the tank. Photo 83 - With the new roundels.... it really has a nice look to it. Photo 95 - After returning from two weeks of work trips and still no word on my seat/subframe.... I decided to pull the wheels/tires and do maintenance on the rear spline, inspect/clean rear brakes and have my new ContiClassicAttack tires mounted up. One thing I did notice on one of the test rides - with my girlfriend on back - was the old shocks had to go - soon... so I looked further into ordering the set of YSS shocks I had researched months ago.... I pulled the trigger a week later. Photo 96 - A few days later - a shipment from UK-based Von Zeti arrived!! Photo 101 - But first....maintenance work. I used some Castrol moly from BMW Motorcycles of Countryside. Photo 97 - ....and here is the start of the fitting of the subframe. The quality is very sturdy and I was pleased with the design. It came primered and only needed slight tab adjustments to fit. I replaced all the hardware and used some shims to make it fit without tension. ....so that is the latest! Hope you guys are enjoying the build! That's a really sharp looking bike. I know that all of the pieces were going to be top notch but it came together as a whole really well. I especially like how you managed to do some "chopping" and upgrading (modernizing?) but the end product is still recognizable as what the bike was originally. Great job on customizing but keeping true to the roots. I'm anxious to see your finished product! Thanks for the compliments guys - this has truly been a journey. I am writing a proper blog for this and a story to go along with it - as well as have a couple photoshoots scheduled. Tomorrow, the bike's first public appearance will be at the Gilmore Vintage Bike Festival near Kalamazoo, MI.... so I am excited to hear feedback from people in person, but this forum is the first I have posted on with progress photos.... and have loved the feedback and assistance! first public appearance will be at the Gilmore Vintage Bike Festival near Kalamazoo, MI.. Here is the latest round of photos I have processed and cropped.... hope you all enjoy! I had mounted up the VonZeti sub-frame and had to make several tweaks just to insure there was no bind, but overall I was really happy with the fit. I got all new mounting hardware as well. photo 99 - The seat I ordered with black leather with titanium gray stitching - as well as piping. It mounts with fender washers and nuts, but I replaced those with rubber washers, fender washers, a wave washer and (4) wing-nuts so that I had easier access to underneath the seat w/o the need to get tools out. photo 102 - Here is an "assembled" image. I rode it like this a bit to make sure the fender height was ok during the ride - so I can hard-mount it. At this point, I knew I needed to removed rear fender and cut it down to match front fender. The rear fender is a R65 fiberglass front fender obtained from ebay for $15.... I made the front mount from aluminum angle mounted to lower cross-frame, a steel strap and some hardware. photo 105 - ...with a set of YSS shocks with adjustable pre-load and rebound adjustment. They "bolted right on" ... with some exceptions. photo 106 & 107 - Being a racer, suspension geometry is pretty important to me and I tried to match up shock angles. I noted some weird angles the left rear shock cambered in and the right rear more positive. I used machined down chrome spacers in the top and bottom of the right shock and the top of the left to adjust them to get them within .1 to one another. photo 108 - this is the top of the left side shock. The right side uses only one smaller shim. photo 110 - bottom of right side shock spaced out for desired angle. Love your build Marc. It looks like it will be a blast to ride. When I had mine fully cafe'd I cut my front fender down similar to yours. I wasn't happy with the height it ended up at and trimmed about a half inch from the end of the fender brace and end of the fender mount tabs. Followed the curve of the tire better IMHO. I even mounted some pretty aggressive dual sport tires just for the look and had to clearance issues. Looks very slick, Marc. Do you think the shock mounting geometry might have been due to the aftermarket subframe? Now all you need are some rear-sets and you can lay down on it and cruise all day! You need to get rid of the coathanger-wire shift link under that rubber boot I noticed in an earlier photo. Pm me some shipping info and I might have one adjustable heavy-duty link left. That would be awesome Justin! PM in process! It is quite possible. I still have original sub - so I might remove and check, but that makes sense. It is a beefy subframe from Vonzeti - much stiffer than original factory one. Looks very slick, Marc. 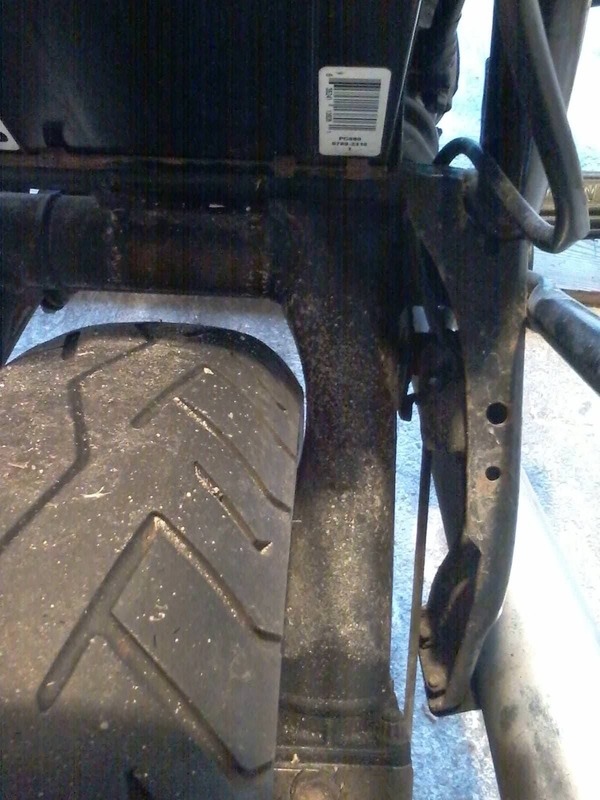 Do you think the shock mounting geometry might have been due to the aftermarket subframe? On the day of the debut... I wanted to give you guys a sneak peek! Photo 112 - I removed the LED's and sub-frame to prep for paint. VonZeti sends the sub pre-primered, so I cleaned it up and shot it in satin black epoxy VHT, which is the same paint used for the carbs and forks. It has proven to be pretty stout. Photo 113 - New YSS shocks resting - waiting to have something to grab on to. Photo 115 - The sub took 3 coats of the Epoxy paint. Photo 116 - At this time, I also finished the cut-down of the rear fender, and painted that as well as the rear license plate bracket/mount. Photo 118 - All my new hardware was laid out and ready for final assembly. Wingnuts, rubber & fender washers for the seat, Long countersunk bolts with aluminum spacers, fender washers and fiber washers for top of rear fender, and hardware for the front of the rear fender bracket. Also in that mix were my X-arc rear lights that you have to snake through the sub-frame hole, and then snake all the wiring through a washer and a nut. It was a tedious process in both wiring and removing and replacing the signals several times. Photo 121 - Subframe finally got mounted - and fitted for no bind, shocks re-attached. Photo 122 - Next up was re-routing the X-Arc signals back in and preparing for the wiring. Photo 123 - Then it was the license plate bracket mounted on the pinch bolt for the rear axle, then torque to spec. ...and the final assembly is completed!!!! and ready to ride down to Kalamazoo, MI for the Gilmore Vintage Bike Festival! Couldn't be happier to share the completed project with you guys. Photo 124, 125 & 126 - Next step was to re-fit the custom cut-down rear fender. I used dual mount points from the sub-frame - with the sub-frame drilled and countersunk. Photo 127 - Next up was getting the rear lights re-wired back and secured. I used a nice wrap. Not shown in this photo is the 1/4" wrap I used for the side wires to match - then sealed it all up with Tesa tape for weather-proofing. Photo 128 - Only needed one zip-tie to secure in place and it is ready for the seat! Photo 129 - Here is the completed bike, shot in my garage. The next day, I rode it down 20 minutes to a photo studio for some "proper" photos to use in my blog build story. I will post those when available as well as any links where the bike gets shared. ORIGINAL BIKE PHOTO OF R65LS - And this is what it looked like in October of 2016, in "ok" condition minus the Krausers. Feels good to have it done, but I have a feeling - it will never be truly done. Since this thing is mostly hand crafted, I'm already looking for things I can update... the frame and engine could be disassembled and painted, some of the brackets could be replaced, I would love to get some custom leather bags to fit where the side skirts used to be... I have plans of making a seat pan for storage and an easier/quicker way to access under the seat. Electric upgrades or custom foot pegs might be cool too... that is what I love so much about this project is it really never has to end.... but I am very happy to be where it is now and can't wait to ride it down to the Festival today and share it with thousands of people. Well, Marc, tell us about the Festival! It was great! Seemed like hundreds of bikes were exhibited, several hundred showed up... an entire field of parking filled with bikes. Beer tents, plus the Gilmore Museum is an amazing experience regardless with cars of all eras on display. I got down there a bit late with my buddy (who had a Kawi 400 Mach 2 and another friend on his Harley. No issues on the ride down - other than a slight tire rub on the rear fender.... which was fixed by raising the mount point on the rear fender to the subframe after I returned home. Also, I pulled the tank and sloshed it around, emptied it, cleaned my fuel filter and my petcock filter and there is no signs of slow fuel flow anymore. The bike is a joy to ride - nimble, quick acceleration - not to mention a major head-turner. Riding into the show it got a lot of looks, compliments and photos taken - which makes me extremely happy. This was my first bike festival and was really happy to see a large array of bikes there... I am not a harley fan, and that seems to be the only bikes around - so the fact that there were Nortons, BSA's, BMW's, Guzzis, triumphs, ducatis, hard to find japanese bikes & several custom bikes. I will post up some pics when I get them off my phone. Lookin' good, I'm sure that sponser will be pleased! But, the more I look at your pictures the more it seems like maybe you have the valve covers swapped. Although they will fit on either side the fins wont sit level if they've been transposed. It might be a trick of camera angles but yours seem to be pointing "up" instead of level. Unless that's the affect you were after, like it's trying to get airborne! OK, I reckon that would 'splain it! You've done an excellent restoration job. I started a similar project myself and I also used the acewell tacho with a cable drive speed sensor. Can you please tell me what setting are you using for the wheel circumference? I have tried 1436 but it's not accurate enough. Hi there... let me go out in the garage when I can and I will tell you what it is set to.... but what I did was use a GPS app on my phone, ride down the road for a kilometer or so... at a set speed.... then checked my GPS max speed. 3 runs and I had found my setting that was within a half mph of my actual speed. How do you like the ClassicAttacks? I got really confused about size, as I looked at my BT45R rear wheel for reference. Its a 4.0-18, which to my understanding should be about 101.6mm wide. I figured the ClassicAttacks 110/90 would be too wide if my BT45 had this little clearence to the swingarm, turns out my BT45 measured with a caliper is 122mm wide (???!!!). So I'm assuming the 110/90 ClassicAttacks fit fine?